Mix your kick to perfection. 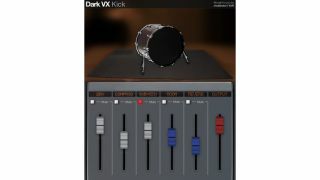 Dark VX Kick is a new sample-based kick drum instrument from Chokehold. This offers five channels that can be mixed together: Dry, Comprsd, Sub Kick, Room and Reverb. Each channel features its own samples, and you don't have to use them all simultaneously if you don't wish to. There are four velocity layers, which even the developer admits isn't a lot. But then Dark VX Kick is free. It can be downloaded now from the Chokehold website for PC and Mac in VST/AU formats.